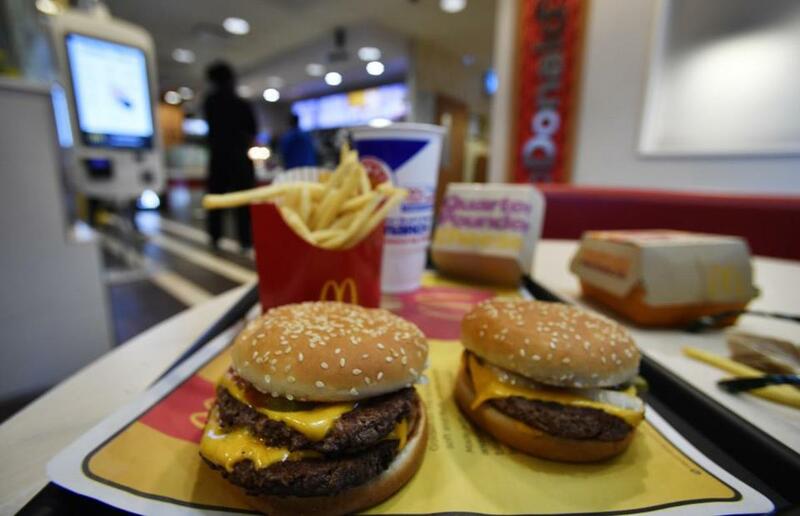 A McDonald&apos;s Quarter Pounder (right) and a Double Quarter Pound burger were shown with the new fresh beef on Tuesday. NEW YORK — The Quarter Pounder is getting a fresh makeover. McDonald’s said Tuesday that it is serving Quarter Pounders with fresh beef rather than frozen patties at about a quarter of its US restaurants, a switch it first announced about a year ago as it works to appeal to customers who want fresher foods. It will roll out fresh beef Quarter Pounders to most of its 14,000 US restaurants by May. ‘‘The result is a hotter, juicier, great tasting burger,’’ said Chris Kempczinski, who oversees McDonald’s Corp.’s restaurants in the US. Its pricier ‘‘Signature Crafted’’ burgers, stuffed with guacamole or bacon, will also be made with fresh beef since they use the same sized patty as the Quarter Pounder. The Big Mac and its other burgers, however, will still be made with frozen beef. The change at McDonald’s is the latest as it seeks to shed its junk food image. It has removed artificial preservatives from Chicken McNuggets and made other tweaks, including replacing the apple juice in Happy Meals with one with less sugar. The company tested the fresh beef Quarter Pounder for about two years in Dallas and Tulsa, Okla. Eight more cities are serving it now, including some restaurants in Atlanta, Miami, and Salt Lake City. It’ll come to Denver, Houston, and other cities over the next month before the nationwide rollout.